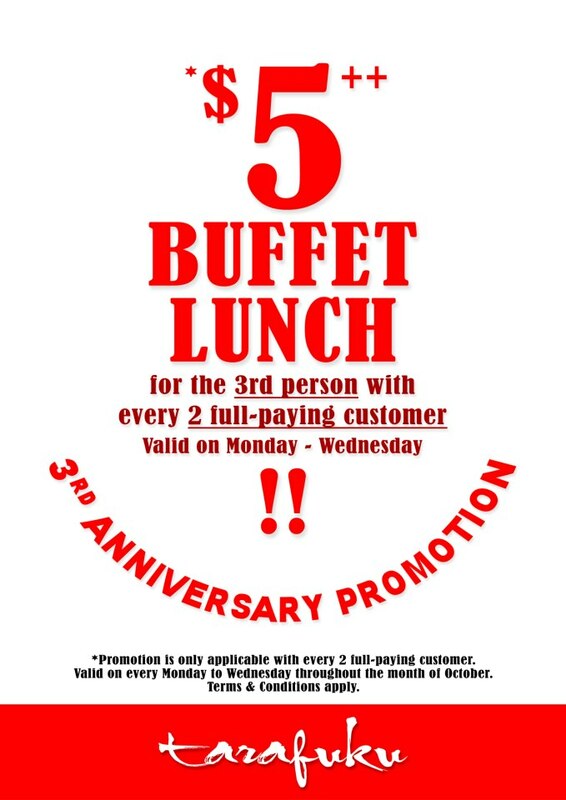 TARAFUKU Japanese Buffet Restaurant is 3yrs old!! They wish to thank you for your continuous support for the past 3 years! and enjoy Tarafuku's 3rd Anniversary Promotion! With every 2 full-paying customer, the 3rd person pay only $5++ !! Valid throughout the month of October. If 2 adult & 1 child dine there, Tarafuku will charge the higher price while the 3rd lower price would be charged at $5++. Therefore the bill will turn out to be 2 adults price plus $5++. Hope to see you soon in Tarafuku.